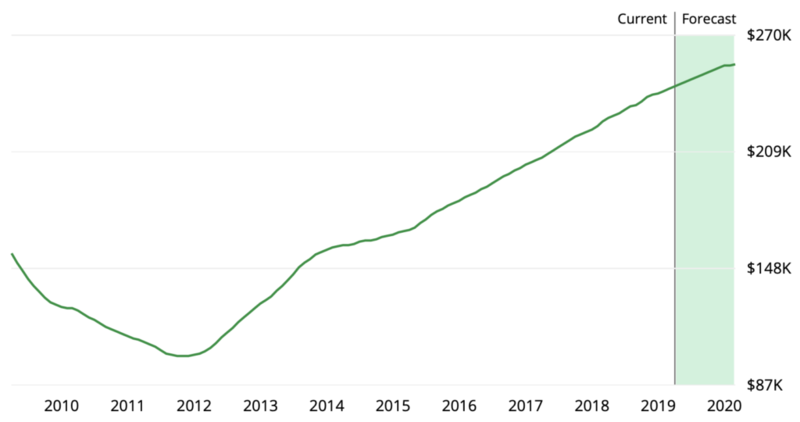 Home prices within the Phoenix real estate market have risen steadily over the past few years, and that trend is predicted to continue through 2019 and into 2020. A lack of inventory is one of the main reasons why home prices are climbing in Phoenix. According to a recent forecast from the real estate research team at Zillow, home prices in Phoenix, Arizona are expected to continue climbing through the rest of this year and into 2020. As of April, the median home price for this housing market was around $242,000. The median for the broader Phoenix-Mesa-Scottsdale metropolitan area was roughly $266,000, during that same timeframe. The chart below, provided by Zillow, shows their home value index for Phoenix going back ten years. It also shows their forecast for house prices in the city, extending into February 2020. As you can see, it has been a fairly steady climb since 2012. Chart: Phoenix home value index. Source: Zillow.com. Housing prices are affected by supply- and demand-related factors. In Phoenix’s housing market, it’s the supply situation that is mostly responsible for rising home values. In short, there aren’t enough homes listed for sale to meet demand. From a supply perspective, the Phoenix real estate market still favors sellers over buyers. There are plenty of people out there looking for houses to buy, but not enough inventory to go around. This also puts upward pressure on home prices. As is often the case, inventory is especially tight at the lower end of the pricing spectrum. More affordable “starter” homes are in short supply right now. This is something Phoenix home buyers should keep in mind, if they’re planning to enter the real estate market soon. In some cities across the country, home prices have begun to slow down or even level off as buyers pull back. But Phoenix is one of those housing markets where prices are expected to continue climbing for the foreseeable future. And supply shortages have a lot to do with that. Still, some major cities offer plenty of bargains for fist-time home buyers in 2019. They include Tampa, Las Vegas, Phoenix and Atlanta. See below. In related news, Phoenix, Arizona was recently ranked as one of the top five housing markets for first-time home buyers. This report also came from the research group at Zillow. Low median home prices requiring a smaller down payment. Strong forecasts for home-price growth to build homeowner equity. A higher “inventory-to-household” ratio, giving buyers plenty of choices. A relatively high share of listings with a price cut. Based on those metrics, a handful of large housing markets rose to the top. Phoenix, Arizona came in at number three on the list of best housing markets for first-time buyers. Tampa, Florida and Las Vegas, Nevada were numbers one and two, respectively. A couple of years ago, Phoenix officially became the fifth most populous city in the United States (after New York City, Los Angeles, Chicago and Houston). The city’s population rose by 12.4% from 2010 to 2017, according to Census Bureau figures. Steady population growth has created more demand for housing in the area, on both the purchase and rental side. This in turn has boosted home prices in Phoenix and also in the surrounding areas. Forecasts for this housing market predict that house values will continue to rise into 2020. And population growth plays a big role in that. When you combine these two factors (a growing populace in an area that has limited housing supply), you have all of the ingredients for continued price growth. Nothing motivates home buyers like low mortgage rates. And that’s exactly what we are seeing right now. Mortgage rates have been on a downward slide since November of last year. This gives home buyers in Phoenix a chance to lock in at a low rate and save over the long term. According to the weekly survey from Freddie Mac, the average rate for a 30-year fixed mortgage was 4.08% during the first week of April 2019. That average topped out at nearly 5% last fall. It has come down quite a bit since then. But there’s no telling how long mortgage rates will remain at their current lows. Home prices in Phoenix, meanwhile, continue to climb. So those buyers who postpone their purchases until later in 2019, or 2020, will likely end up paying more for a house. Disclaimer: This article includes home-price forecasts for Phoenix, Arizona. Those predictions were issued by third parties not associated with the publisher. Real estate market predictions are the equivalent of an educated guess and should be viewed as such.